Colebrook 7-pc. Dining Set The Colebrook 7-piece dining set embodies casual design at its finest. The plank tabletop and rustic oak and black finishes have a country chic look that's enhanced by the bowed, spindle-back chair design. Plus, the two extension leaves make it easy to accommodate guests or large family dinners. The Colebrook 7-piece dining set embodies casual design at its finest. The plank tabletop and rustic oak and black finishes have a country chic look that's enhanced by the bowed, spindle-back chair design. Plus, the two extension leaves make it easy to accommodate guests or large family dinners. I have had the table for under 6 months. We have a large family, and the table is very used. I have been cautious to use placemats, however, the top is starting to bubble up in places where the top got wet and was not wiped up immediately. While I LOVE the look of the table, I am disappointed that it is not more durable and doesn't stand up to family usage without a table cloth. The spindles on the chairs in black are showing through. The service tech told me that is the way they are supposed to look. I paid for black chairs and now some hybrid color is what I'm being told I should accept. Just bought a new house and was going to have an Amish custom table/chairs made... UNTIL I saw this set!! I went to look at it thinking the quality just wouldn't be the same but I actually like the table MUCH better that I thought I would!!! And for a third of the price!! Love the black chairs with it, it's just the primitive look that I've been looking for!!! I posted pics on FB and have had 2 friends go buy the same set!!! LOVE IT!! 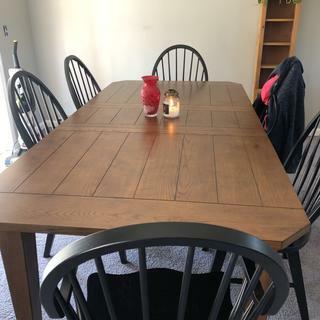 We recently downsized and needed a dining room set that would be comfortable for just the 2 of us and also allow us to host larger family gatherings. This set not only accomplishes this but is beautiful and very well made. The delivery was on time and the delivery personnel very professional and suggested how to store the leaves when not in use. We have had this set for about 6 months now and couldn't be happier. The table is beautiful and seats 6 for everday use and with the two leaves we can seat 12 comfortably. Easy to maintain and fits in with our new modern kitchen while still being casual. We purchased 4 black chairs and 2 oak captain chairs. Love the mix of the two colors. Delivery and setup was exactly as promised! This dining set is beautiful! We paired it with the black chairs and bench. The expansion with the leaves makes it perfect for holidays and parties. While this set looks rustic and fits in well with our decor, it is NOT FAMILY FRIENDLY. If you leave a sweating glass on the table, the finish bubbles after some time. Thankfully, we did get the protection plan so the table was replaced a year or so ago. However, since then, we have noticed the finish is beginning to wear away. In a few years I think we'll need to sand it and refinish it ourselves. For the price of this set, we should not have these problems in my opinion. The cracks between the boards also collect crumbs which are very difficult to get out unless you vacuum them with the brush attachment. Had I known all of these things would be a problem before we got this set, I would have shopped for a different set. family, and everyone can be accommodated. I have had this set for several months already and have been extremely pleased. With large family gatherings and the ability to open the table to seat 12, entertaining is much simpler. Cleaning is a snap and the table top is very resilient. The black chair complement the table perfectly! We recently purchased this dining room set and absolutely love it. It looks beautiful in our dining room and we couldn't be happier! Our salesman was great to work with and the process and delivery was great! High quality furniture, looks great! Would definitely recommend. The table is great, nice size and looks amazing with the black chairs. It is the perfect set for my dining room. We looked at multiple sets in many stores but this was just what we wanted. We are so happy with our choice. Beautiful pieces and it coordinates with my other purchases. My whole family can sit at 1 table! Built well, and just beautiful! My dining room is down primitive style with crows and chair rail with black/brown check . We got the chairs in black and table in oak. Matches my hutch which is in black and oak. Sturdy and roomy . Everyone will fit this Easter dont have to put a folding table up. love the look of this table & chairs, we also bought the black bench and black hutch and they look great. seem like they are sturdy, time will tell but we have only had them two days and we love it. This table has a terrible finish on it. You can't use a table clothe or place mats they stick to the table. the table looks nice when you buy it, but soon after the table looks AWFUL!!!! BEST ANSWER: With the leaf included at 108" long, the Colebrook can comfortably seat eight. Is this table solid wood and will the surface withstand hot and cold beverage glasses without staining or leaving rings? BEST ANSWER: The Colebrook table is crafted of hardwood with oak veneers. This table is meant for everyday use. It is fine to set a glass down on the top, although we don't recommend leaving a glass on it for long periods (like overnight) as that could cause a ring to form. Wiping the table with immediately with a damp cloth should also help prevent the formation of rings. No!!! The table is garbage! DON'T waste your $$$$. The finish comes right off!!! does the table come in cherry color wood instead of oak? BEST ANSWER: Hi Anthony. The Colebrook dining set is only available in Rustic Oak or Rustic Oak with Black. Our table is 2 years old and the brackets that keep the table level while it is extended to install the leaves is broken. How do we replace the brackets? If we extend the table without the brackets it will collapse. Is there a bench for this set? BEST ANSWER: Yes, the Colebrook collection does have a bench. It come in rustic oak and black. BEST ANSWER: We do not recommend any specific cleaning products. The manufacturer actually requirements: Wipe with a damp cloth. | Dry thoroughly with a clean, dry cloth. | All spills should be cleaned up immediately. We have 96 inches in which to place this set. Is that enough space for the table and chairs without the leaves, and still have walking space? BEST ANSWER: The table length without leaves is 72" long. You would want to allow 32" of space to comfortably fit a chair at each end. With one chair the dimension is 104" and two chairs would be 136" of needed space. How is it cleaning the top? Do crumbs get stuck in the grooves? BEST ANSWER: The top is simple to clean. The crumbs do not get stuck in the grooves. The manufacturer recommends dusting with a soft cloth. Any other style chair offered besides arrowback? BEST ANSWER: The only chairs available with this Colebrook are the chairs displayed with the set online. However, you could certainly purchase chairs from a different collection to go with this table if you would like. We would be more than happy to assist you with this over the phone at 866-383-4484 option 3.